The Market Square Farmers’ Market accepts EBT/SNAP benefits and is doubling all transactions up to $10! Come to the information booth to swipe your EBT card to receive tokens to spend with eligible vendors. The doubled tokens (black tokens in $1.00 increments), funded by the AARP Foundation, can be used on fresh fruits and vegetables at market. The EBT tokens (red tokens in $1.00 and $0.25 increments) can be used on any food not to be consumed on site, as well as any food producing plants. Only have a debit/credit card but need cash? Come to the information booth to swipe your card ($2.00 service charge) for Market Money tokens in $5 increments. Market Money is our own currency and can be spent with any vendor just like cash. Vendors will give change back, or you can save them for a future market. They can also be used like gift certificates. Community Supported Agriculture (CSA) has become a popular way for consumers to support a farm while enjoying the bounty of the harvest. What is a CSA? A customer buys a “share” of the harvest for a season, paying the farmer up front for a basket of produce delivered each week. While a CSA share is not for everyone, it can be a great way for customers to develop a relationship with a farm and learn more about what diverse products are available. The MSFM has many farms delivering CSA shares during the market. 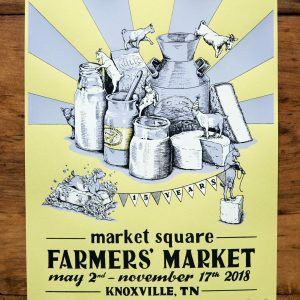 On Saturdays, The Market Square Farmers’ Market offers a service called the “Veggie Valet” for customers who purchase items and wish to have them held while they have lunch or continue shopping. This unique service is offered during operating hours and is free of charge. Our Veggie Valet is conveniently located on Wall Avenue near the stage on Market Square, perfect for picking up those large/heavy purchases with your vehicle. At the close of each market, volunteers with the Society of St. Andrew visit our vendors and pick up donations from our farmers and food producers. These “extras” are then donated to local agencies providing food to the hungry. The Society of St. Andrew also will provide each participating vendor with a detailed account of their donations and provide them with a donation statement to use as a deduction on their taxes.